Image description: Nancy is outside, smiling toward the camera. She is wearing a red floral shirt. In back of her is a pond with plantlife growing in it. 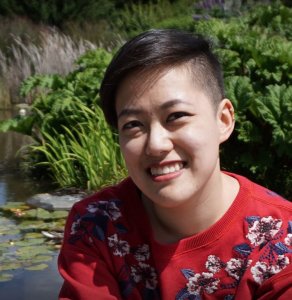 Nancy Chen (she/her) has been volunteering with APIENC since 2015. She started off transcribing for the Dragon Fruit Project and joined the Core committee in 2017, APIENC’s leadership body. Nancy identifies as queer and non-binary. Outside of APIENC, Nancy works with elementary and middle schoolers at the Chinatown YMCA, just up the block from the APIENC office! Back in her high school years, Nancy was involved with the youth program at the Chinatown Community Development Center and was previously involved with Reading Partners doing literacy work with children. Nancy aspired to be a freelance writer, so she studied English Literature at Smith College and graduated back in 2015. While looking for work as a freelance writer, Nancy did admin work but found it challenging. Eventually, she realized she missed being in Chinatown, so she decided to shift her work back to her community. She’s dabbled in some arts/arts education non-profit work around SF and been around the Chinatown community in various capacities. Her experience helped politicize her understanding around access to affordable housing and safe living conditions for low-income immigrant families. Nancy found herself doing an AmeriCorps term at the Y, and now she is here! When Nancy started volunteering with APIENC, she was a “smol bb queer” and super scared of joining because that meant coming to terms with her queerness. She was tasked with transcribing a Dragon Fruit Project interview for the very first time. Nancy remembers how it was really impactful to transcribe someone’s story. That interview resonated so deeply with her own experiences and helped her realize that she made the right choice in filling out that volunteer interest form. Nancy’s love of APIENC has continued on to this day! She loves fighting for collective liberation, celebrating resilience and being in community with wonderful folks who share these values. Her hopes for the LGBTQ API community are that we continue thriving. Want to know a fun fact about Nancy? Here are three! Nancy is a Virgo and a Hufflepuff. Also, she really doesn’t like Oreos. This entry was posted in Blog, frontpage, Volunteer Spotlight by API Equality. Bookmark the permalink.